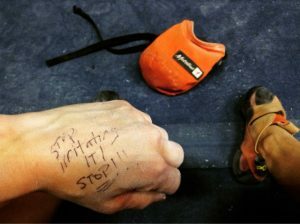 As climbers we push ourselves constantly; climbing and training through pain to either luckily climb past it or inevitably have the pain stop us from doing what we love. Recently, I met my wall; there was no way up, down, backwards or forwards to keep climbing. A wall is a stop sign with a cop car behind you. You have to stop. 100%. My wall gave plenty of warnings before actually setting its pillars down. In hindsight, those warnings taught me some valuable lessons. For one, when I start climbing again, training smarter will be my priority. But what does training smarter mean? And more so, why do we even push ourselves to the point of pain? Before going into injury prevention by training smarter, it is important to address the underlying causes of injury. By this, I don’t mean the physical aspect but more, the emotional and mental motivation behind it. Many athletes have the tendency to ignore the subtle messages and feelings that warn us of the dangers of ‘one more try’. In our efforts to improve, the small tweaks and pains are ignored for the voice of the ego. We become impatient with our bodies and the process; ignoring the fine line between make or break. With thought only on the climb in front of us, we push and ignore our bodies’ limits and messages while tinkering on the brink of destruction. This is a similar mentality to how we treat our earth; humans seem to like tipping points. Admittedly, I am guilty of all of the above but am learning from my mistakes and embracing the idea of going slow and steady with longevity in mind. It is exciting to be revamping my training mindset with the idea of mastering basic movement while slowly preparing the connective tissues to match their design and capabilities. So - how do we get better without wrecking our bodies? Though not complete, below is a list of indispensable things learned from my own experience as well as invaluable advice received from people more adept than myself including physios, national team coaches and world champions. Know yourself. Beyond the physical messages, our body gives warnings in the form of subtle thoughts and feelings that tell us we are approaching its limit; hunches that warn us that one more try probably isn’t a good idea. This is our intuition; our inner intelligence pointing us towards our best interest. Listen to that. It trumps everything and everyone around you even the physio, doctor, and especially, the ego…!! Our bodies know how to be born, how to grow, and heal. Listening and respecting that intelligence means stopping before it hurts, definitely stopping when it hurts, and being patient with ourselves and the process. We must think long term; past the boulder or route in front of us and onto the many years of climbing we have ahead. Don’t ruin yourself for a send or training session. Sessions should be short and sweet: the standard guideline for maximum strength training is two hours or less. Any longer is ineffective. However, if you are training endurance, you can go longer. If you can’t stop and want more, try double sessions. One in the am, one in the pm, leaving at least two hours in between to rest and recover. Doing one more set when you’re tired is only putting yourself in a hole that gets deeper with each try, making recovery even harder. Be patient; stop when you feel strong, and don’t go to failure. central nervous system fatigue. This can occur after too many hard sessions in a row and can be really harder to recover from. Use periodization training to prevent this and keep a training log. Working the same move repeatedly is not only tiring to those specific muscles but is also teaching your body bad movements pattern for that particular crux; by repeating that failure you are teaching it to fail. While many moves take lots of work, it is inefficient to work it for hours upon end. Walk away and go back only when fresh in your body and mind. Strength and improvement do not come over night. The best climbers have taken years to get where they are and many would say they are still learning and improving. Going slow with training is healthy as it gives the body time to adapt to the added stress. This is especially important for our tendons and ligaments which develop and strengthen a lot slower than muscle. Start with the basics and slowly move upwards only when your body is prepared. This will really help prevent injury down the road. Slow and steady wins the race but since it isn’t a race, chill out and think long term..! Climbing is a movement based sport. You’re training should comprise of at least 75% towards movement. Climbing strengths and abilities can improve dramatically by focusing on climbing movement itself. Although weights can definitely play a role, there is no point in training to deadlift 200 pounds if you can’t place your foot efficiently and properly. 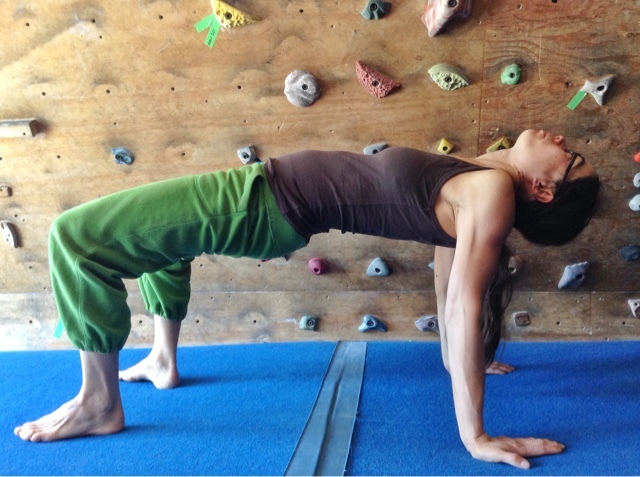 Focusing on movement is also easy on the body and really beneficial for making one a ‘better climber’. Go into the gym and practice foot work, drop knees, hip overs, cross overs, dynamic and static movements, etc. Or better yet, go outside! Nothing like a bit of rock to teach you the intricacies of movement! For an outsiders eye, get a coach! For more info, check this post I wrote for training advanced movement drills. The unfortunate thing about tendons and ligaments is by the time they send their messages of pain, it is too late. The damage is already done and recovery now takes a lot longer. Try to find that sweet balance so they don’t get to that point. Stop when still feeling strong, before you think it might hurt and definitely stop if it hurts. A great stretch for the biceps and shoulders. For example, one day while doing physio I was listening to a podcast about training and injury prevention. The guy was talking about the subtle messages we receive from our bodies that warn us of its limit. As I was doing my I, Y, T’s with small weights, a very little pain rushed through my shoulder that normally I’d ignore as it was just so freaking small but as he continued speaking, something clicked… I immediately dropped the weight and did the exercise with bodyweight alone. The pain stopped. My body wasn’t ready for that increase and was being kind enough to tell me. From that day on, my focus has been on listening to those little messages and my recovery has only been going uphill. Training is stress on the body. Combined with the general stresses of life, that is a lot of wear and tear. Don’t overdo it, be patient and take care of yourself. Get plenty of sleep, eat a balanced healthy diet with wholesome, nutrient dense unprocessed foods that will meet the demands of a recovering body and last but not least, know your body well enough and listen to it! If you are doing physio, focusing on doing the moves well to speed recovery. If you have enjoyed this post feel free to show your appreciation and donate to my blog! Cheerios.